Easter weekend is almost upon us and if you’re still looking for some fabulous gluten free Easter recipes, I thought I’d put them all in one handy post for you! I know a lot of people give up chocolate for Lent, so those of you who have might be pleased to know that pretty much all of these are chocolate-based! And also, an apology to those of you who are gluten and dairy free. Sadly these all contain dairy, but I hope that you might be able to adapt some of them, and in each recipe I think this is possible, I’ve given some suggestions of how to do this. So whether you’re after something to make with children, decadent Easter brownies or even Easter gift ideas, here are some gluten free Easter recipes to get you started! 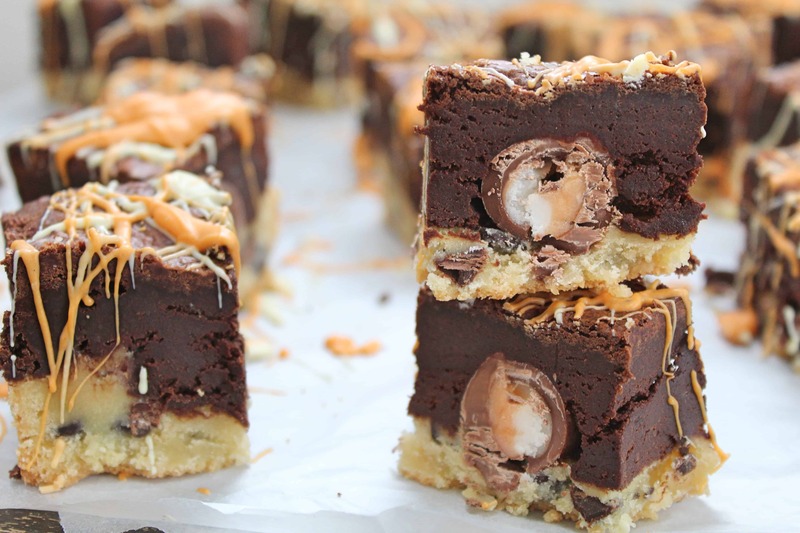 If you’re going to make something classic, it has to be my gluten free Creme Egg brownies. 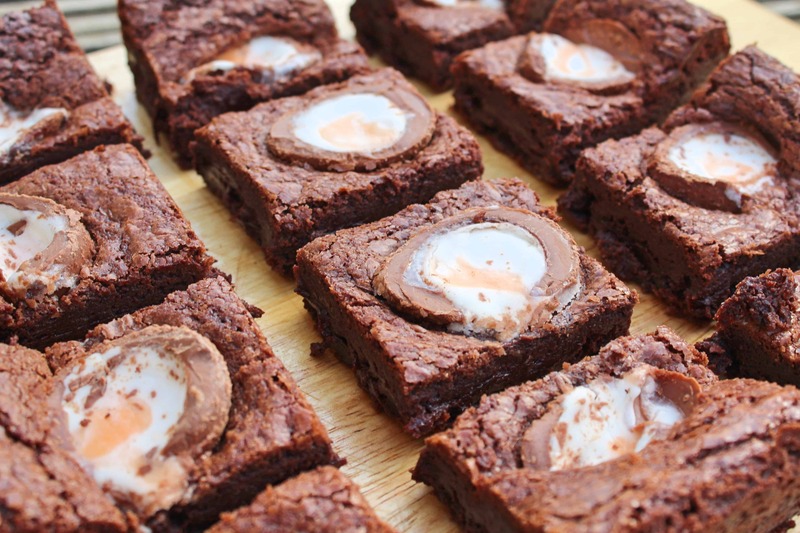 Fudgy and delicious, they taste insane and also look so cute with half a Cadbury’s Creme Egg in each slice. I dare you to see if you can share a batch! Find the recipe for my gluten free Creme Egg brownies here. Creme Egg brownies not enough for you? Go one step further with my gluten free Creme Egg slutty brownies – named that way because they’re filthy! With a cookie dough base and each slice hiding a mini Creme Egg inside, these are the ultimate recipe if you have a sweet tooth! Find the recipe for my gluten free Creme Egg slutty brownies here. Perhaps you prefer white chocolate over milk or dark? In that case, you need to try making my gluten free Mini Egg blondies. These are almost borderline fudge – and taste so amazing with the crunch of Mini Eggs too. They look fantastic and are easy to make. 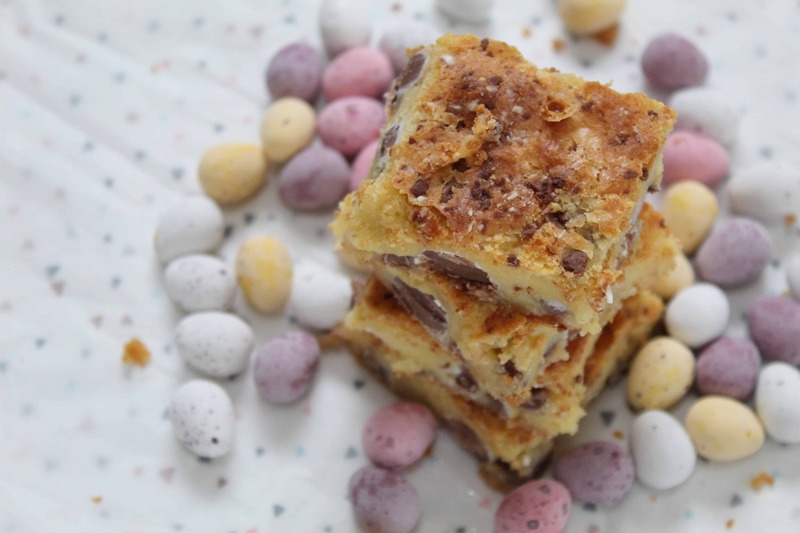 Find the recipe for my gluten free Mini Egg blondies here. This is an awesome recipe to make if you just want something quick, or you’re making dessert for just yourself. 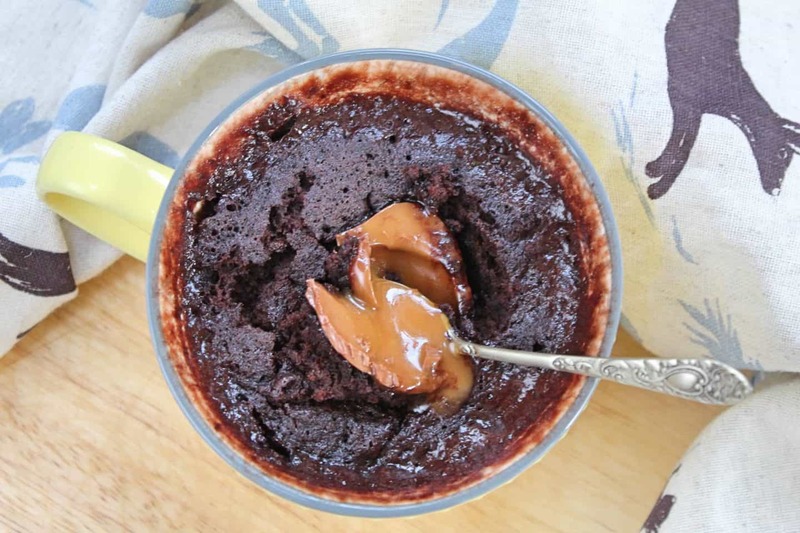 This rich and chocolate mug cake is ready in less than five minutes, and has a gooey caramel egg on top as well. The perfect dessert for the Easter weekend! Find my gluten free caramel egg mug cake recipe here. This is a great recipe to make with children, as you can get so creative with it! 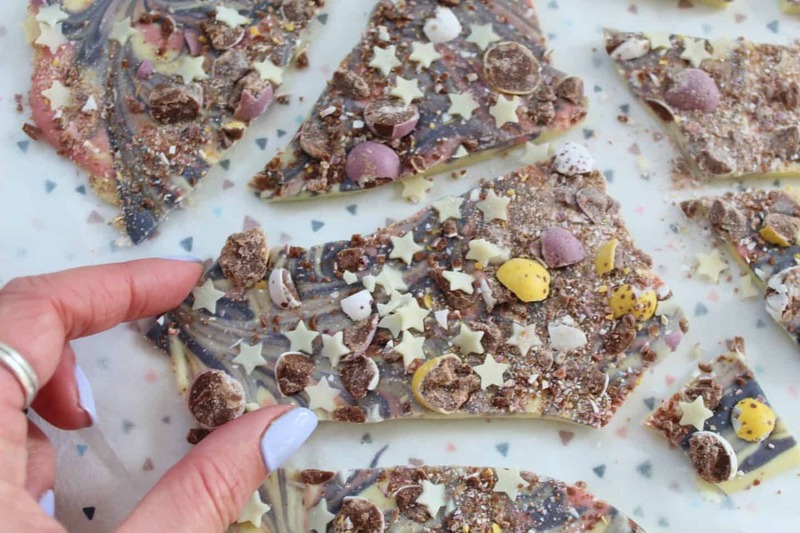 My gluten free Easter bark is seriously easy to make – why not have a family competition to see who can make the prettiest one? It also makes a great homemade gift instead of Easter eggs. Find my gluten free Easter bark recipe here. Can’t bake, won’t bake? 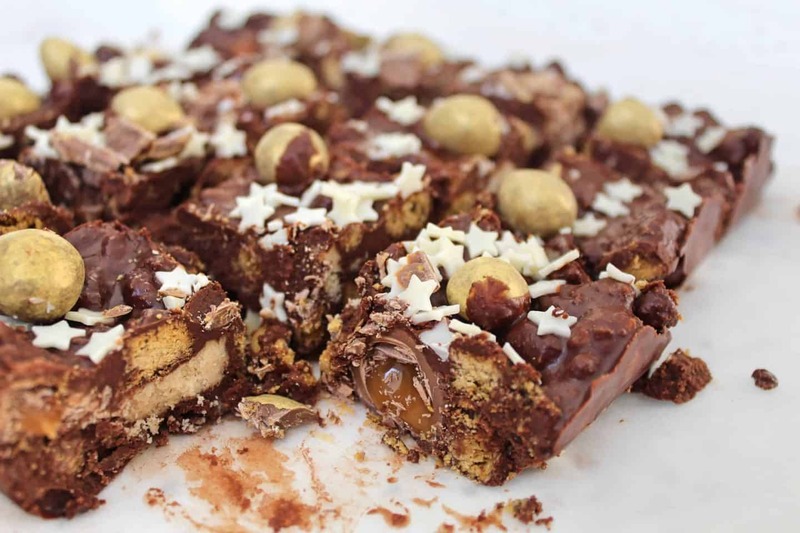 This gluten free Easter rocky road recipe stuffed with caramel eggs and golden Galaxy eggs is the one for you. Just bung it all together and pop it in the fridge, and you’ve got the perfect Easter treat. It couldn’t be simpler! I even managed to make this in my office with only a wine bottle to crush the biscuits… true story! Find my gluten free Easter rocky road recipe here. I made this recipe a kind of Shove Tuesday/Easter mash up, but honestly it’s incredible any time. 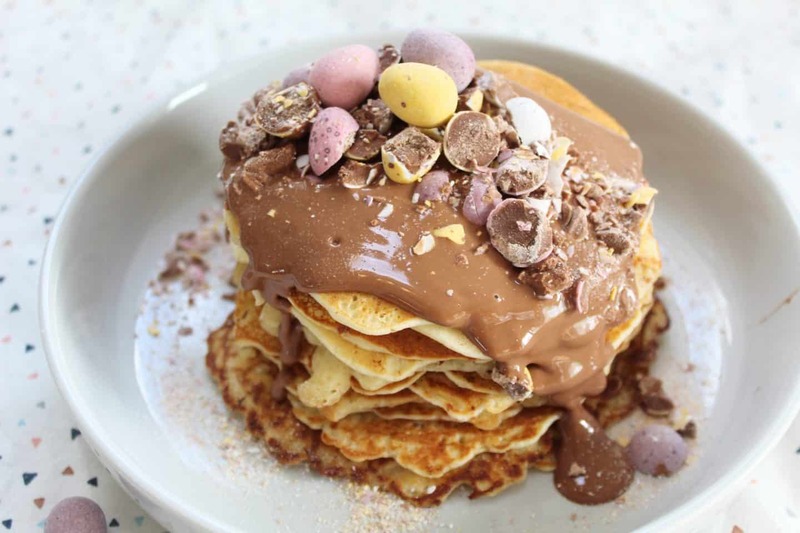 A pack of golden, fluffy pancakes topped with melted chocolate and filled with crushed Mini Eggs. This a great indulgent dessert of brunch – or even breakfast, why not!? Find my gluten free Mini Eggs pancake recipe here. 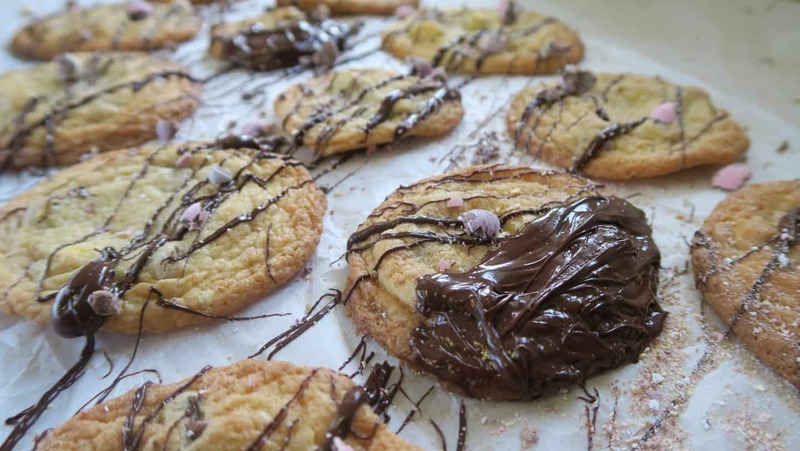 And for my final Mini Egg inspired recipe, why not give my gluten free Mini Egg cookies a go? They’re chewy and delicious and a lovely recipe to bake with the kids. They’re a complete classic and you could even try the recipe with golden eggs or Smarties eggs if you like. Why not go crazy!? Find my gluten free Mini Eggs cookies recipe here. With a simnel spice and a cute apricot jam ‘yolk’ there gluten free Easter egg biscuits are seriously cute. 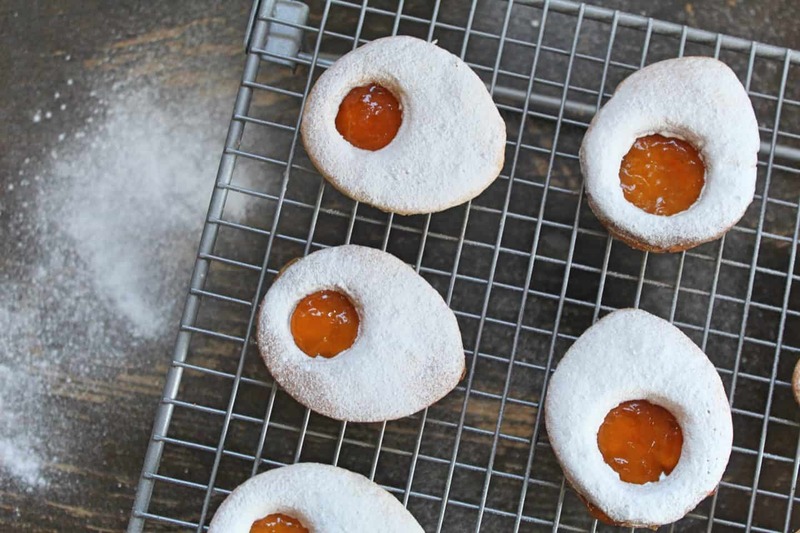 They have the lovely gentle flavourings of mixed spice, lemon and almond extract, as well as the sweet tang of the jam inside. Another great one to make with kids as they’ll love sandwiching them together. Find my gluten free Easter egg biscuits recipe here. And here’s one from the archives! 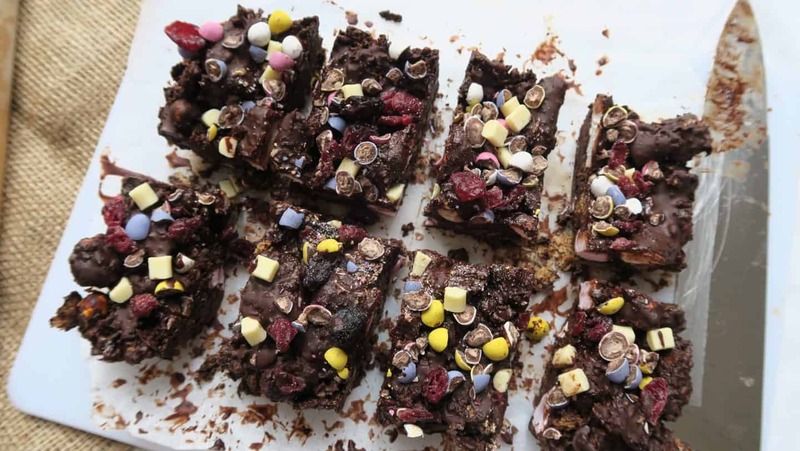 I made these gluten free Easter rocky roads with sugar free marshmallows, chocolate and biscuits, so they’re perfect if you’re gluten free and either avoiding sugar or diabetic! They’re certainly the most angelic-looking of all my Easter recipes! Find my gluten free lower sugar Easter rocky roads recipe here. Need more gluten free Easter recipes? 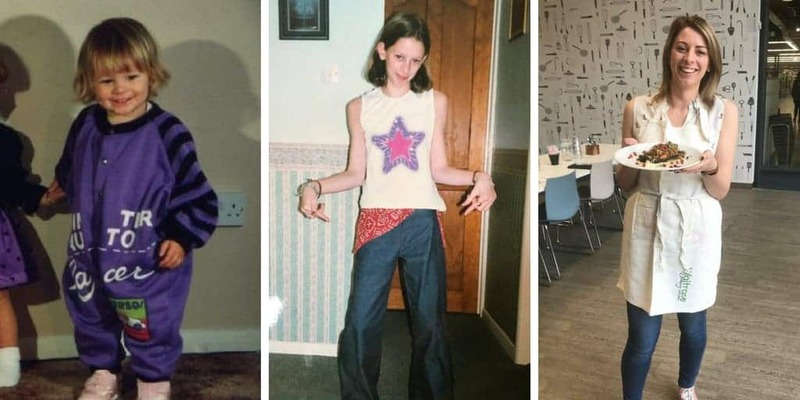 If you’ve made all these, firstly, you deserve some sort of Bake Off trophy. 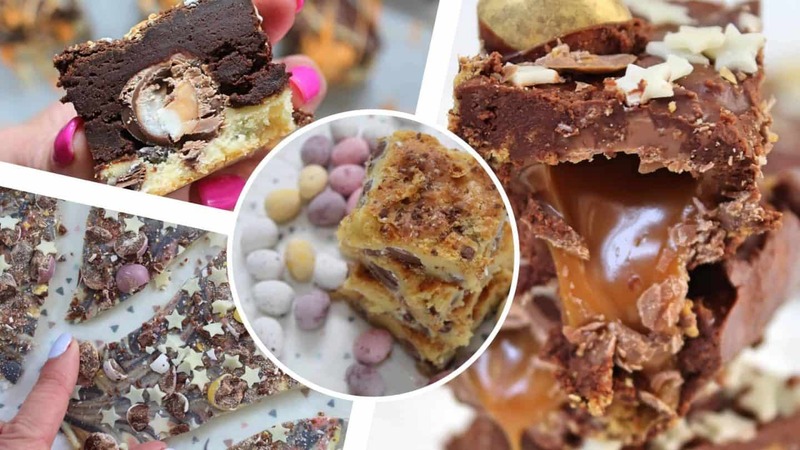 Secondly, why not check out some of these other gluten free Easter recipes from some of my other favourite gluten free bloggers? 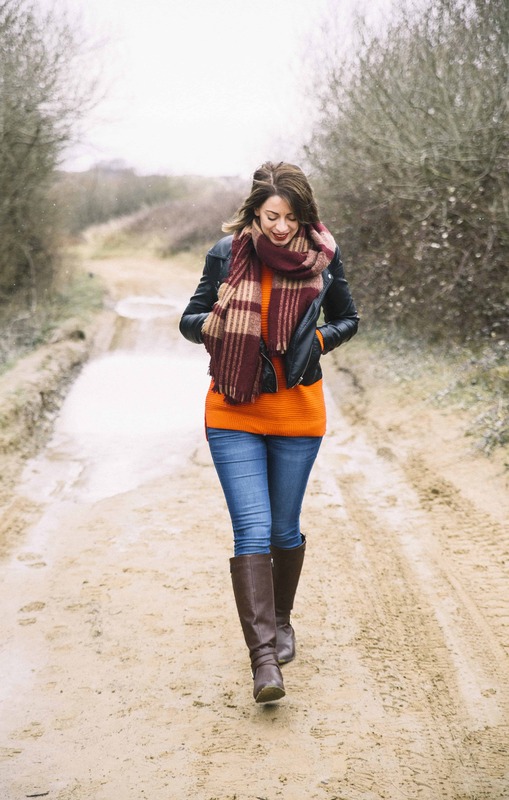 These are all on my ‘to make next’ list!